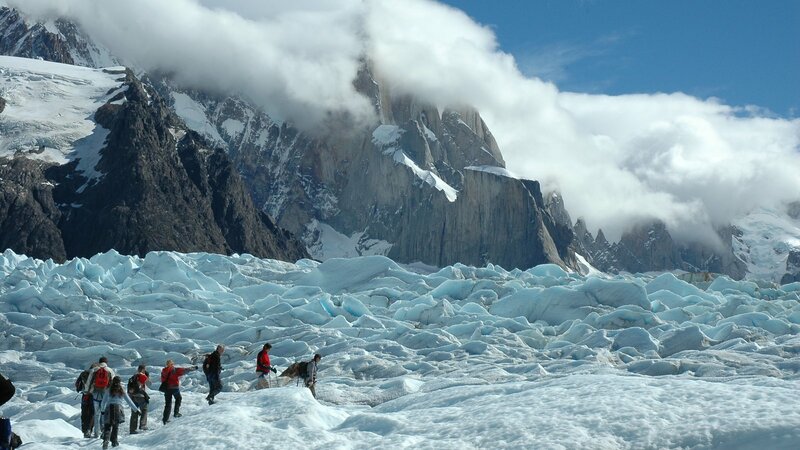 The Andes, the longest mountain chain in the world form the backbone of Argentina. And thus, the region is home to a lot of winter destinations filled with snow. Different cities like Ushuaia, Bariloche, Mendoza, etc. are surrounded by numerous snow parks that offer a wide range of activities to do on the snow from skiing to snowboarding, hiking to snowshoeing, etc. 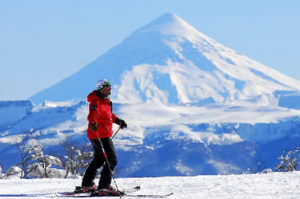 The following are some of the most famous snow parks in the region. Mount Chapelco tower behind the skier. 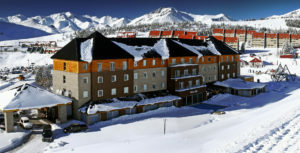 Mount Chapelco is a famed skiing destination known for its great slopes and spectacular scenery. It is famous for tourists all over the world, and its popularity has only been increasing every passing year. The ski resort has 20 different trails some of which pass through the Lenga forests while others give you great views of the Lake Lacar down below. 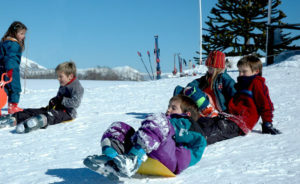 The snow park which is a part of the resort offers various other activities to do such as snowboarding, ice castle building, etc. for visitors to do. Caviahue is a snow park that is located right at the base of Mount Caviahue, a volcano. The place offers various sporting activities such as skiing, snowboarding, sled riding, snowshoeing, etc. But the real reason for the popularity of this resort is the presence of volcanic hot springs filled with minerals. These springs are just about the right temperature for people to bathe in. Tourists throng to the park just to take a dip in the mineral-filled waters of the springs. Kids enjoying in Batea Mahuida ski resort. Batea Mahuida is another volcano the slopes of which have been turned into a skiing resort. But unlike Caviahue, this volcano has been extinct for a long time. And this led to the creation of a volcanic lake in its crater. The surroundings of the lake were soon inhabited by the indigenous Mapuche community who still own and run the resort. 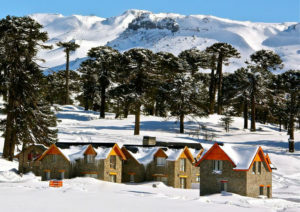 The resort offers a unique opportunity to travelers as they can experience the culture of the Mapuche community along with having fun in the snow park. 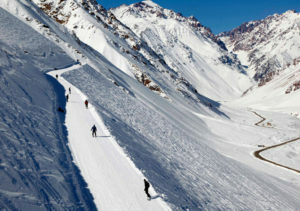 One of the oldest snow parks in all of Argentina, it was opened in the year 1979 and has been popular with tourists from both home and abroad ever since. The main reason for the popularity of this snow park is the diversity of the trails. The trails have something for every type of skier. Both beginners and professional skiers can go out on these trails and enjoy themselves to the core. Apart from that, the resort is also popular for the beautiful scenery it is surrounded by. Shutterbugs just love to take out their cameras and click away all day long. There are places to spend the night in the ski resort. Sometimes called as the Mecca for skiers, this snow park is a treat for everyone who loves to be out in the snow. Activities include skiing, snowboarding, snowmobile riding, snowshoeing, hiking, sledding, etc. 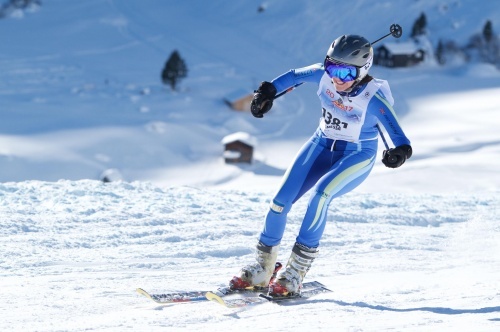 Las Leñas also plays host to a number of both national and international winter sporting events. So, if you are not the one to go out on the snow yourself, you can be content with watching professional athletes showcase their skills on the various trails and areas of the snow park. Cerro Castor cable car ride to the ski area. Convenient. 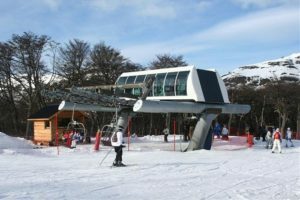 Cerro Castor is one Snowpark that has steadily risen to fame over the past few years. Located in the southernmost most city in the world, Ushuaia, this resort is relatively smaller in comparison to the others on the list. But it compensates the lack of size with beauty. The scenery surrounding this resort is simply spellbinding. It is one of the main reasons why it finds itself on this list.